The park ranger held it up between her thumb and forefinger. It was a mere two inches long. Behind us was a colossus, the General Grant sequoia, the second largest in the world and located in Kings Canyon National Park, standing at a prodigious 268 feet in height. That a seed from a cone can produce one of these giants is one of nature’s wonders. The word majestic doesn’t enter into my vocabulary often. I seem to use it when I travel because of amazing things I see. It’s even more rare for me to apply it to a living thing. The giant sequoia (Sequoiadendron giganteum) is one of them, a tree so massive and tall that on first sight you’re likely to be left speechless, in awe. Today, they are endemic only to the western slopes of the Sierra Nevadas in California. The ranger continued to describe additional interesting facts about the tree as well as its historical and political importance. The sequoia isn’t the tallest tree. That distinction belongs to its cousin, the coastal redwood (S. sempervirens), though the sequoia’s height is no slouch, mature specimens reaching 250ft or more. But by the sheer volume of its height and massive, slowly tapering trunk bottom-to-top that can reach 20 feet in diameter, it is earth’s biggest tree. When looking straight up from the base, I was unable to appreciate its relative size. However, on the Giant Forest Loop, I got to see just how big it is in relation to us mere humans. Here’s a curious fact. The longer a sequoia lives, the better it’s able to defend itself against intruders. Tannins will foil bugs and fungi and the thick bark and resin-free sapwood will hinder fires. Lightning can scorch the tree, blackening the exterior and core, but the sequoia remarkably heals itself. I should be so tough in my golden years. For all its hardiness, the sequoia is defenseless against humans. Some very large specimens were cut down in the latter half of the nineteenth century. What it took for a tree to grow in excess of a thousand years was undone in three weeks by two-man saw and axe. Even in the age of Manifest Destiny, people were outraged that trees much older than Methuselah were destroyed. Many stumps can still be seen along the Big Stump Trail in Kings Canyon. The fight to save the sequoia was so seminal to the conservation movement and establishment of our national park system that the ranger I mentioned above informed us the sequoia cone symbol appears on every Park Service ranger’s hat band. I will be sure to look for it when I visit the next national park. To say that I was privileged to see fall colors at Sequoia National Park is an understatement. This gift was totally unexpected. The plan was simply to experience the giant sequoias. While the ancient trees lived up to expectation, it was a bonus that the dogwoods, maples, aspens, cottonwoods, oaks and willows were changing color to give the forest understory a radiance, a shimmering glow of yellows, oranges and reds. 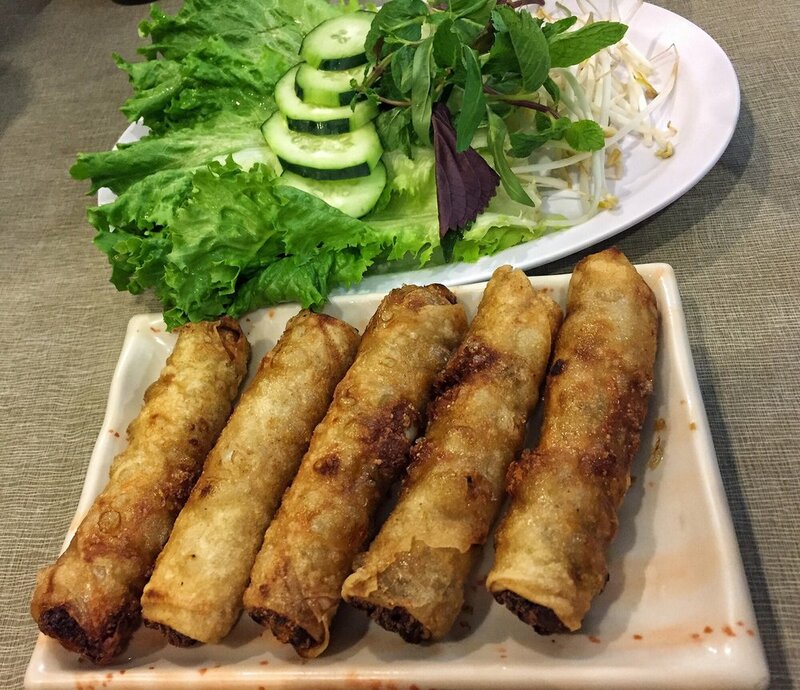 Serendipity doesn’t strike often. 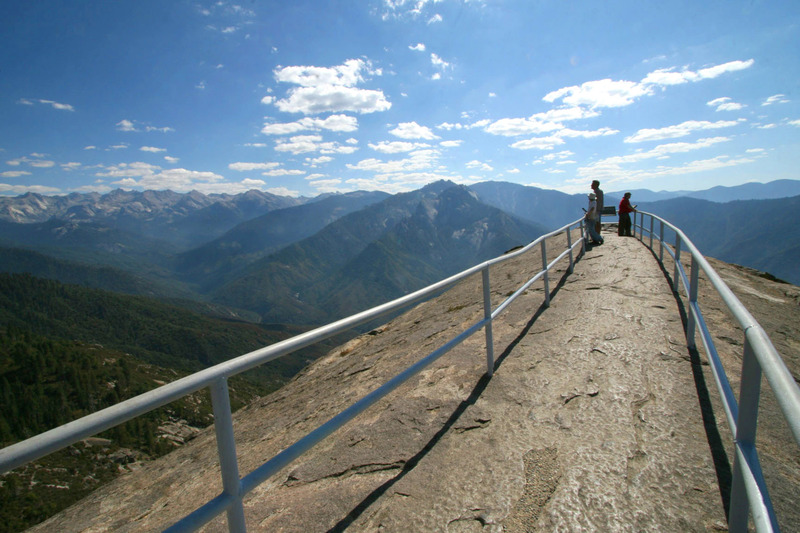 It’s a breathless exercise to climb the roughly 350 steps to the top of Moro Rock, which summits at 6,725 ft ASL. No, this is not the Morro Rock along the California coast but a granite monolith in Sequoia National Park. The effort to complete the climb of 300 feet is worth it for the views. If you’re prone to acrophobia, it’s likely you’ll not get very far, because the stairway winds tightly around the granite rock’s contours, one side sometimes facing the dropoff of a thousand or more feet, and the passageway occasionally is wide enough for only one person to pass. All along the ascent, every view was more splendid than the last. At the summit, I was rewarded with a spectacular vista of the Sierra Nevadas’ Great Western Divide. Granite domes like Moro Rock are common in the Sierras (think Half Dome in Yosemite), shaped over eons by a process called exfoliation where sheets of rock get shed (spalled) because of upward expansion. There are several more in the park that are relatively easily accessible. This amazing rock-cut and concrete stairway construction is not recent, but another formidable achievement of the Civilian Conservation Corps. It was built in 1931 and extends almost 800 feet bottom to top. Why weren’t similar public works projects launched after The Great Recession of 2008? Moro Rock is not as popular as other attractions, maybe because it’s located just inside the park’s southern entrance and visitors are anxious to see the giant sequoia trees. Still, it should be on everyone’s list of things to do, just be sure there isn’t a lightning storm before the climb.